Nobody gave us a deadline for providing the document. I’d just as soon wait to see if we can get it tomorrow. I haven’t heard anyone today asking for it. I already passed the one document to them and told them I was working on the GA document and would pass it along when I got it. Lets respond and say the site team is modifying the document based on senior management comments. We expect a draft document tomorrow and will provide then. Or something like that. Maybe that will keep the emails down for a day. Thoughts? Jim, I’m really struggling with getting this Global Assessment. Marty said we could provide it, as long as we throw in the caveat that it’s draft, and Mike’s e-mail below seems to indicate he supports release of the draft, but it seems the ET is still unwilling. I told Michael Dudek to give the site team another day to work on it, and hopefully we’ll be able to get a copy tomorrow. 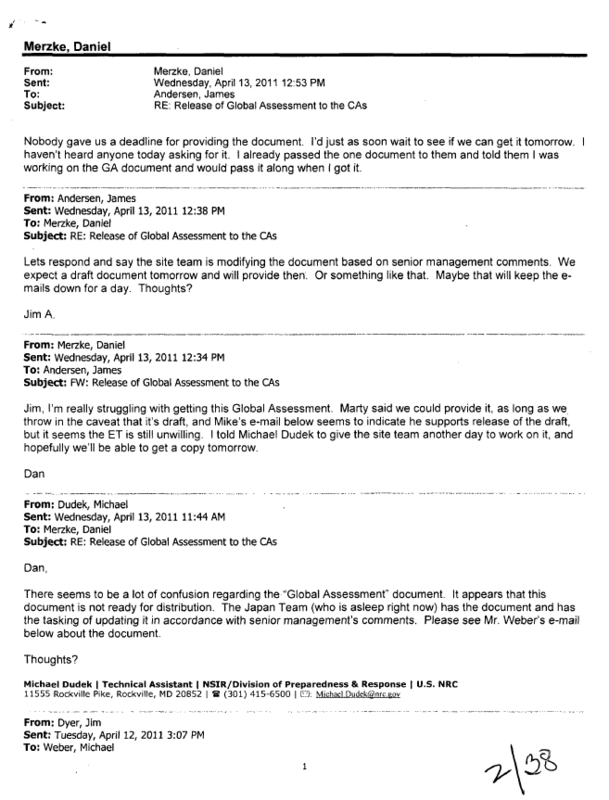 There seems to be a lot of confusion regarding the “Global Assessment” document. It appears that this document is not ready for distribution. The Japan Team (who is asleep right now) has the document and has the tasking of updating it in accordance with senior management’s comments. Please see Mr. Weber’s e-mail below about the document. Mary is working on this with the Ops Center, so we should be able to provide the documents promptly. One clarification that I would offer – Chuck Casto and the Japan Site Team are developing slides on the global assessment. I’m not aware that a “Global Assessment” exists at this time; I understand that it is being developed, but it is quite preliminary. In addition, we do not know whether Chuck and the team will have the opportunity to interact with the Secretary of State, let alone share with her the Global Assessment. Consequently, in response to the first request, we can provide the first draft of slides on the Global Assessment, recognizing that they are quite preliminary and have not been fully vetted. The other two requests should be easily fulfilled. Can you please assist in providing this information to the Commission offices? March 14th, 2011 – Receiving petitions to shut down all plants – Need NMSS help!